Beautiful gardens, pine trees and breathtaking sea view surrounding our luxury spa in Corfu all add to the rejuvenation process. Choose from natural therapies based on Greek herbs and flowers. Relax in the pool or the Jacuzzi pool (use at extra charge). 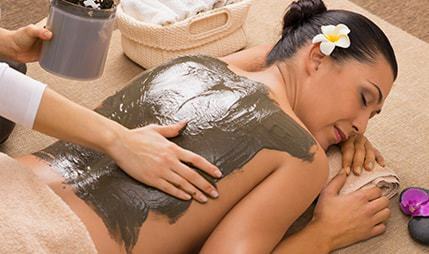 Enjoy the benefits of full body ‘Daphnila Garden Elixir massage. Or perhaps the mineral & seaweed therapies are more to your taste and lifestyle. Pamper yourself with this relaxing package of treatments in a customized sequence that features water cannons, jet water massage and bubble seats for an effective combination of full body relaxation and help with problem areas. Improved skin tone and circulation are just two of the rejuvenating effects of thalassotherapy. 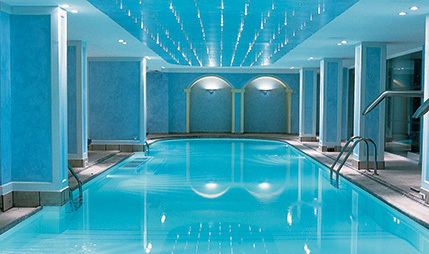 The thalassotherapy programme is effective in relieving stress, combating insomnia, relieving mental fatigue and easing muscular and joint pain. Mineral-rich seaweed is applied in a body wrap in a special treatment that has proved effective in aiding weight loss, toning and firming tissue and fighting stress. This treatment is especially effective in helping get rid of cellulite. Restores body energy, balances body aura, revitalises, moisturizes & improves skin firmness. An alchemist’s secret from antiquity, which blends the four elements of life: water, air, earth & fire. The best-known goal of the alchemists was the transformation of common metals into gold. This exclusive skin therapy harnesses nature’s most luxurious element, gold, and the delicate scents of wildflowers with incredible revitalizing effects that rejuvenate skin and boost vitality. Open up skin pores in the sauna to prepare body and mind for the ultimate pampering that follows. A gentle body exfoliation using a special aromatic peeling will improve body micro circulation followed by a rich golden body mask which restores smoothness, suppleness and body energy. A silky iridescent powder completes your treatment using the healing power of gold, copper and silver minerals combined with Artemisia flower extracts for deep moisturizing. In the magic of this heavenly treatment find the true Potion of Life! A journey to the sea: a three-salt exfoliation, made of selected salt for their richness in minerals and trace elements release epidermis from dead cells. Followed by a re-mineralising seaweed wrap and a regenerating massage using beeswax and essential oils. The laminaria body wrap regulates the metabolism, re-mineralizes, moisturizes and protects the skin.A journey to the sea: a three-salt exfoliation, made of selected salt for their richness in minerals and trace elements release epidermis from dead cells. Followed by a re-mineralising seaweed wrap and a regenerating massage using beeswax and essential oils. The laminaria body wrap regulates the metabolism, re-mineralizes, moisturizes and protects the skin. Detox Treatment which enhances metabolism. A light body scrub exfoliates and prepares the skin for the Special lymphatic massage that follows and tones the blood circulation. 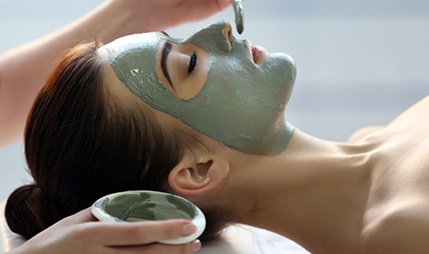 Aplying a mineral mask with dolomite argil rich in elements and vitamins which will detoxify and tone the skin. Detoxifies, combats cellulite and obesity, revitalises, moisturises, tones and firms the skin, speeds up metabolic rate, anti-stress. This programme is wonderful for removing dead skin cells plus incredible mind-body effects, which will leave you invigorated and revitalized from head to toe. A short session in the sauna or steam bath will prepare you for the ultimate pampering treatment. A gentle body exfoliator packed with active ingredients starts the purification process followed by a Dead Sea mud body mask. Afterwards relax in the marble tube full of essential oils and marine salt extracts. Let your skin absorb all the vitamins and minerals, boosting cell regeneration, whilst you are cocooned in a comforting wrap. Following the sea polish, indulge in a relaxing aroma massage. The unique aromas envelop your body in a fresh, light scent while they relax your mind and restore your skin with lasting hydration. A detoxifying treatment performed specifically on legs. It activates the lymph glands to flush out liquids, thus making the muscle tissue firmer. Ideal for combating cellulite and stimulating your body systems. This wonderful harmonizing face and body treatment gently sloughs off dead cells from the skin’s surface allowing nutrients to penetrate deep into its layers, leaving skin soft, firm, supple, and silky to the touch. Start with body exfoliation with a wonderful combination of fine marine mineral crystals and a semi-precious balm to make the skin smooth and velvety while relaxing body and mind. A special body wrap follows with a smooth-textured combination of pink mineral clay rich in trace elements, semi-precious balm and precious oils. Applied over the entire body to release accumulated tension and provide a feeling of well-being and absolute serenity. This excellent treatment is further enhanced with a short facial treatment, leaving the skin refreshed and hydrated. This after-sun body treatment soothes and refreshes the skin after sun exposure! A specific body wrap with hibiscus flower extract repair the skin, and a complete body moisturizing soothes the sunburn. Intensely hydrated, the skin is soft and the body is perfectly relax. A cleansing and relaxing ritual combination of enveloping movements and the use of a self-heating mud to relax the deep muscles and relieve joint tension. The self-heating oligo-active mud detoxifies the body and creates a profound feeling of relaxation in areas of muscle tension. Its enveloping warmth and crackling foam gives the skin a real feeling of well-being. Ideal for all skin types, this treatment offers deep moisturizing that will leave your skin radiant. A special 42-movement modelling massage tones face, neck, and cleavage. The treatment ends with application of a special Payot collagen mask that hydrates skin, plumping up tissues and erasing fine lines for a fresh, luminous complexion. A complete therapy to prolong youthfulness and firm the skin. Corrects the fine expression wrinkles while rejuvenates and energizes skin cells. It gives an immediate freshness and enhances skin glow. Treatment for oily and mixed skins. Antiseptic ingredients and lactic acid have the purpose of cleansing and nourishing the skin for spectacular glow. Enhanced deep hydration treatment with Hyaluronic acid, herbal extracts, ginger and chamomile. Hyaluronic acid activates the deeper layers of the epidermis for better bonding of collagen and elastin fibers. The skin is hydrated, improves its elasticity and gains a natural and healthy look. This comprehensive treatment is adapted specifically for men’s skin and involves highly concentrated marine oligo-elements. It removes traces of fatigue and strengthens the natural radiance of the skin. This cream mask combines white clay and seaweed to purify and absorb impurities while taking care of sensitive and delicate skins. The epidermis is rebalanced, and the complexion is radiant and glowing once again. Aimed at sensitive and fragile complexions, this mask soothes and rebalances the skin. In order to quickly reduce any discomfort, this pleasantly cool mask contains seawater which prevents inflammation and soothes sensitive skin. Foam gives the skin a real feeling of well-being. Book your room online and Save up to 20% on the "Ancient Spirit Elixir", "Daphnila Garden Elixir", "Elixir Marine Ritual" & "Elixir of Life" treatments. For more information please contact the Elixir Thalassospa +30 26610 90320 or email: reservations.db@grecotel.com.